Enter the handsome young writer, Joe Gillis who is fascinated by her past glories. Can he create her glorious comeback to the screen? This award winning musical will sweep you away with the romance, jealousies and excitement of Hollywood. Packed with Andrew Lloyd Webbers’s stunning music which includes the show stopping “With One Look” as Norma says the immortal words, “and now Mr DeMille, I’m ready for my close up!”. Be sure not to miss out on yet another Garrick musical success. Review – Rick Bowen – Altrincham Messenger – 5 STARS ‘Sunset Boulevard – musical movie magic at Altrincham Garrick’ SUNSET Boulevard takes us back to the golden age of cinema when people worshipped the ground movie stars walked on. Hollywood, an exciting place where dreams could become reality and hopes could be dashed in equal measure. Altrincham Garrick’s fabulous production left me wondering why this show isn’t performed more often. The score is a non stop delight, frequently having the feel of an old school film score. Rehearsals must have been a pleasure from start to finish for director Neil Coe, lucky enough to work with the likes of principals like Steven Finney, Vicki Clarkson and Natalie Bennett, who should be plying their musical trade on a professional stage. Luckily for us, they aren’t and the end result is an evening of pure magic in a theatre that just can’t stop raising standards. Finney plays Joe Gillis, a screenwriter who falls under the spell of a faded star of the silent screen Norma Desmond. Desmond, brilliantly played by Vicki Clarkson, is desperate to make a comeback and is the expert when it comes to playing the vulnerable victim, shunned by the industry she still loves. When they sing on their own they’re incredible, together they’re sensational. Like these two Bennett is outstanding as Betty Shaeffer, the young script writer who dreams of making a name for herself in the movies. All three could sing the phone book and it would be worth paying good money to hear them.It would be easy to be catty about Lloyd Webber’s musical style, which can lack subtlety sometimes, but this is his best work for me, an honour I’d previously given to Evita. So, how frustrating it was to see some empty seats on opening night because this is a major musical triumph for Altrincham Garrick. Packed houses for the rest of the run are the least the theatre deserves. Magnificent and magical. SUNSET Boulevard takes us back to the golden age of cinema when people worshipped the ground movie stars walked on. ?Hollywood, an exciting place where dreams could become reality and hopes could be dashed in equal measure. ?Altrincham Garrick’s fabulous production left me wondering why this show isn’t performed more often. ?The score is a non stop delight, frequently having the feel of an old school film score. ?Rehearsals must have been a pleasure from start to finish for director Neil Coe, lucky enough to work with the likes of principals like Steven Finney, Vicki Clarkson and Natalie Bennett, who should be plying their musical trade on a professional stage. Luckily for us, they aren’t and the end result is an evening of pure magic in a theatre that just can’t stop raising standards. Finney plays Joe Gillis, a screenwriter who falls under the spell of a faded star of the silent screen Norma Desmond. Desmond, brilliantly played by Vicki Clarkson, is desperate to make a comeback and is the expert when it comes to playing the vulnerable victim, shunned by the industry she still loves. When they sing on their own they’re incredible, together they’re sensational. ?Like these two Bennett is outstanding as Betty Shaeffer, the young script writer who dreams of making a name for herself in the movies. All three could sing the phone book and it would be worth paying good money to hear them.It would be easy to be catty about Lloyd Webber’s musical style, which can lack subtlety sometimes, but this is his best work for me, an honour I’d previously given to Evita. ?So, how frustrating it was to see some empty seats on opening night because this is a major musical triumph for Altrincham Garrick. Packed houses for the rest of the run are the least the theatre deserves. Magnificent and magical. 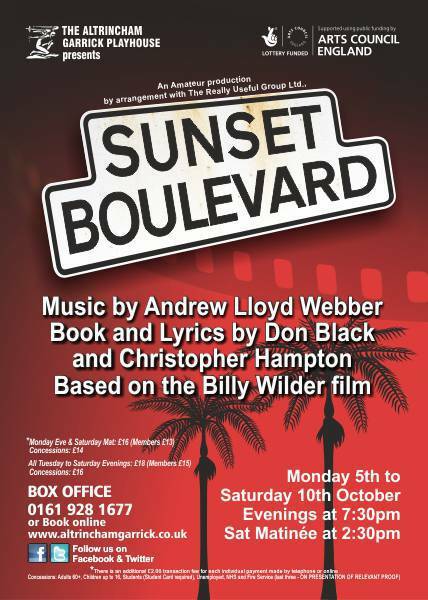 Altrincham Garrick could not have chosen a better show than Andrew Lloyd Webber?s Sunset Boulevard for their first musical of the year. ?Lloyd Webber?s score played by an on stage orchestra is captivating and I am surprised so few people know of this show. ?The original book and lyrics are by Don Black and Christopher Hampton. ?Based on the 1950 film of the same name, its stage premier was in 1993.?It?s about Norma Desmond, a silent movie actress of a certain age whose career takes a dive when talkies arrive. ?Rather than retire she employs young Joe Gillis to work on her screenplay and, thus, deliver a comeback. She uses her womanly wiles to ensnare him as her toy boy. ?But it is not to be. Despite the desperate attempts by Norma to keep him in her clutches, he falls for the much younger Betty Schaeffer. ?Vicki Clarkson, who plays the seemingly confident Norma, with panache, belts out her most famous numbers – With One Look and As if We Never said Goodbye charismatically. Yet Clarkson illustrates a woman with ingrained sadness. ?You suspect that the disillusioned star is losing her mind as she becomes more and more dependant on Joe. The higher you rise, the lower you fall and this one time star feels the pressure. ?This comes to a head in the final, tragic scene. ?Clarkson fills this major role brilliantly but equally important is the part of Joe. Steven Finney is an exceptionally good leading man. Finney comes into his own as he, too, has a lovely voice. His clear vocals spell out the narrative clearly but, more important, is what he doesn?t say. Even when he kisses the former star, you know he feels pity rather than love for her and his expression spells out a bird caught in a gilded cage. His true love is 22-year-old effervescent Betty Schaeffer (Natalie Bennett)?The attentive butler trying to shelter her from reality is played by David Gill who conveys strangeness about his character that puts you on your guard. He conveys in song his affection for Norma. The Garrick?s costume and set designers add much to the musical?s success. And, of course, no musical can be a hit without an excellent supporting orchestra which we have.